Gas leaks are extremely hazardous! Not only is there the potential for toxic compounds to enter your home, but gas leaks also present risk of explosion! With a serious enough gas leak, even something as simple as flipping on a light switch can cause a spark that’s enough to blow up your whole home. If you smell gas in your home, get out as quickly as possible, touching nothing electric or electronic. When you’ve reached a safe place, call 911 and have the fire department shut off the gas. Once they’ve declared the house safe, call J.B Plumbing and Rooter! Our gas line repair experts can find the source of the gas leak and take care of it in no time. Remember – gas leaks aren’t like faucet leaks. You can’t put them off until you decide you want to call the plumber – it’s important to have gas line repair as soon as possible. 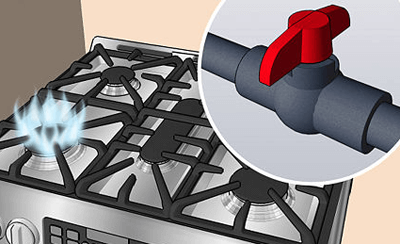 DO NOT attempt gas line repairs on your own – not only do gas line repairs legally require a permit before they can be taken care of, but the slightest spark, even a static shock, can cause the gas to explode. In addition to emergency gas line repairs, J.B Plumbing and Rooter also provides gas line installation services for all your gas appliances.